I’m excited to announce that as of today, the PlayStation Now library includes PS4 games! This lineup is just the start, as we’ll add more PS4 games in the coming months alongside our regular monthly content drops. On top of that, PS Now’s library has now ticked to over 500 games. That’s a massive range of games to explore and play, all with one subscription, the push of a button, play on your PS4 or Windows PC. 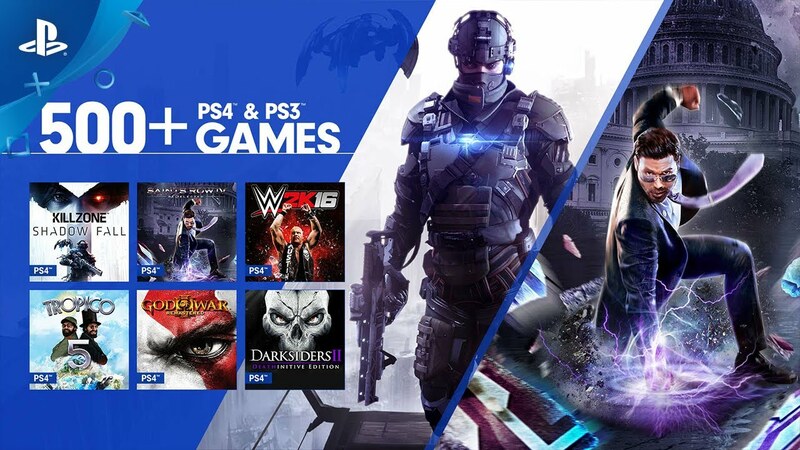 With PlayStation exclusives like Killzone Shadow Fall and The Last of US, hit blockbusters such as Red Dead Redemption and Batman Arkham City, indie games like Journey and Broken Age, and many more, the PS Now library really has something for everyone. Now is the perfect time to try PS Now, or upgrade your existing subscription. By popular demand we are bringing back our $9.99 intro offer for the first month (new subscribers only), and the 1-year subscription for $99.99. That’s less than $9 a month for a full year of on-demand access to an ever-expanding library of PS4 and PS3 games to stream any time you want. Start streaming today because this offer is only available until September 22, 2017. Here is the full list of all of the new PS4 games available as of today on PlayStation Now. We’ve got a variety of genres, from FPS, action adventure, RTS, fighting, racing, and more. We already have 100 publishers in the service, with plenty more great PS4 and PS3 content coming this year and next from SIE and other top publishers such as 2K, Aksys, Capcom, Codemasters, Deep Silver, Double Fine, Kalypso, Loot Interactive, MESSHOF, Metalhead, NIS America, Ripstone, SNK, THQ Nordic, XSEED, Zen Studios, and more. Regardless of the platform, PlayStation Now is all about great games. Some of the best games ever released were on PS3, many of which are available on PS Now. Here are the top most popular 20 PS3 games on the service so far this year. Hell yea! I’m glad it’s finally here. I’m gonna try it out tonight. Can you please bring back Vita support for PSNOW? I loved using it on there and would potentially be a subscriber for life of it comes back. 500 extra vita games and more added monthly is awesome. Keep the price at $10/month, introduce local/offline caching, and let people play games on PS Now that they already own (via disc or digital purchase). You can offer PS Now as a great backward compatibility offering for PS4 owners, but in it’s current state, it’s not worth it. For those whose excuse it is to why pay for a game you already have, here’s what I would do. Stop the weird crying and find that game you already have physical or digital and then umm play it. Weird I know. PS Now is for the games you DON’T have. Common sense is so hurtful these days. Great news! You can enjoy any PS4 digital or disc purchase right now! It’s a great system. Allow people to play their games without being near their PS3/4. This allows people to be able to play their PS3 games with their computer, instead of having two systems connected all the time. Sometimes people travel and they can use their laptop/whatever to play their games. Pretty obvious and an intelligent perspective on his part. Your sarcasm on this point shows immaturity and lack of thought on your part. 2nd: Allow people to play their games regardless of their connections. A ‘physical download’ so to speak. Again, this should be pretty obvious reason why it is a good thing. His third point is that the service is just wildly, unacceptably overpriced and it is. You’re effectively renting games at a premium. I could do this cheaper from online renters AND get a physical copy. when is PS now coming for the rest of the world? It’s nice to see more stuff being added. Any news on PS1 and PS2 games? I am not going to lie, I am really impressed. I still won’t use the service (I have over 200 PS4 and 400 PS3 games) but my view have improved. Best wishes. It would be awesome to have voice/party chat in PS Now. Playing on PS4 is not an issue if you join a party with other PS4 players playing on PS now or on PS4 but playing on PC there is no option for Voice Chat. Hope it is something that is offered now since multiplayer PS4 games like Killzone have arrived. I see you removed option to be in a party on PS4 now while using PSNow. What is the point of multi players games on PSNow like Killzone if no way to chat with clan or teammates? It really takes away from the experience. Plus lack of add on and DLC support really hurts the need to fire up a PSNow version of a game. I liked playing on PS4 in a party with others using their PSNow so we could have private chat. Oh well was a nice feature. Spoke too soon. I see Party chat still works with PS3 PSnow games on the PS4 just not with PS4 games. I see why now as your technically logging into a new PS4 when streaming on Now so all background apps close out. Be cool in future if chat worked though. I get I can use many other methods of chat while playing just was convenient to use the PS4 headset mics. Still waiting for it to be availible in Argentina. I don’t care for PS+, but I would permanently subscribe to PS Now, since I never had a PS3. +10, reco y a favoritos. Lo vengo esperando por lo mismo, no me interesa el plus por el online y porque vienen dando juegos malos, pero esto lo pagaría por los juegos de PS3 que nunca tuve. We need PSNOW on more countries!!!! You really think all the new PS4 games are going to be available on PSNow? HAHA, you have no clue. It will be more like 2-3 years or more before you see a newly released PS4 game on PSNow. If you want to wait a few years and still have a sub-par performance compared to native PS4, go right ahead m’lady. About time this happened. Now I don’t need to buy a PS4 after all. PS Now just keeps getting better every month. To be fair you said “no reason to own a Playstation 4 now”. Unless you want to wait 3+ years to a play a game on a streaming service, i’d say there’s still plently of reasons to own one. I noticed with the addition of God of War 3 Remastered, the PS3 God of War 3 game was removed, per the list on the website. Can you please make the PS3 version of God of War 3 available to purchase? Thank you. You really need to let this go. You have been asking for years and it’s not going to happen. If you had save data from the PS3 version of god pf war since that version has been removed does it carry over to the PS4 remastered version ? Wow, 500 games is a huge collection and quite a landmark! How come you guys havent added Playstation All Stars already . Its your own game published and developed by your own studios. I would really love to play it on my PS4 since you guys keep crushing our hopes every E3 for a sequel for 5 years straight. I’ve literally been waiting for the PS Now 1 Year promo price to come back around. I thought it wasn’t going to happen until PSX. I would gladly pay $100 a year for these games. I missed out on so many great games and it’s nice that I can finally play catch up on some many great games. Glad you can get in on the 1yr deal! Yeah, there’s a ton of great content to keep you busy all summer. As it’s been said already I would really like downloading and offline play. I don’t like getting disconnected when I’m away from my PS4 for 5 minutes. I liked the service overall but can’t deal with having to restart the app and or lose save progress because I have to leave my machine. Thank you for considering the feedback. Sigo esperando por este servicio en México. Lagging, or choppy streaming is your internet. Might want to check in to that. Very Nice!!!! Hope we will see 10+ PS4 Games added each month. Maybe now you can understand why I’m so concerned about how I’ll play some of my favorite games once my 2nd PS3 fails on me. Because there’s no way that I’m gonna pay to stream them with degraded quality when my library of around 150 games that I’ve already paid for is sitting right in front of me. I’m just gonna have to buy another PS3 or pay Sony to replace it with a refurb like I did the first time. Would still be cheaper than paying for a Now subscription. I believe PSNow has the potential to be a great service, but it’s disheartening to see that Sony doesn’t care enough to provide an option that caters to their older supporters. This is a great service in my experience with it but…. Bethesda – Fallout 3, Fallout NV, ES IV: Oblivion, etc. EA – Dragon Age Origins, Dragon Age II, Mass Effect Trilogy, etc. We need you Sony, to do whatever it takes to make this a true backwards compatibility solution by working out deals with the major players who are missing in action here. As for most of them, who knows, but I know EA isn’t very on board with PS Now since EA Access is a thing playstation opted not to support because Sony didn’t see the value in it. EA didn’t take kindly to that. This sounds great, but quick question: as I understand PS Now uses customized server hardware with SOC’s of various playstation consoles. So, my question is, for streaming PS4 titles, are the games running on standard PS4, or PS4 Pro? Would appreciate this is the price was lower 100 bucks for the currently lineup in my eyes is pretty steep. If this was 50 I might bite. It’s nice adding PS4 games to PSNnow but how about supporting other countries that support you where is PSNnow for the rest of US ? Say I’m rocking Battlefield 1, on my ps4 console, and my girlfriend gets bored of watching me rain hot death on people and decides to use my pc to fire up ps now and play Red Dead Redemption. Will her signin into my PS Now, on pc, effect my gaming on the ps4? I just want to know if we can both enjoy our games without any sacrifices. Please bring back Vita Support! $100 for a 1 year subscription finally the price is right. Next add support for streaming purchased ps3, vita, and psp content. It makes no sense we can’t stream our own content for a similar price. Always glad to see more games being added to PSNow but lol its funny how y’all call “PS4 games” but add a bunch of recycled crap from the PS3.Whats the point of adding PS4 games to it anyway?…PSNow main objective is to make PS3 games available to the PS4 public who never had it a PS3. – what about the other 200+ countries in the world (Especially the Middle East)? – When will you support them? Please ps now on ps Vita please, no pc Windows, pleases on ps Vita ps now . I really miss the support of the PS now on the vita. Why would it come to this? Its just not right. Why just why damn it. I had so much fun streaming playing the last of us! It was gorgeous! I love the jump scares when I’m on bed everyday at night to play PS now. But now it….lying there in my vita home menu waiting to play when that time. i was about to pay for another month to play it..didn’t then let me, till that day was the time Sony stop supporting…so upsetting. I really miss the support of the PS now on the vita. Why would it come to this? Its just not right. Why, just why damn it. I had so much fun streaming playing the last of us! It was gorgeous! I love the jump scares when I’m on bed everyday at night to play PS now. I noticed that the PS3 version of god of war 3 is available on PSNOW already and that the PS4 version god of war 3 remaster was recently added to PSNOW. If I started a game on the ps3 version of god of war 3 would I be able to carry my save over the remastered version of GOW 3 ?